The original DYKDDDDK peptide (the same epitope recognized by Sigma's Anti-FLAG®** antibodies) was an 11-amino-acid leader peptide of the gene-10 product from bacteriophage T7 fused at the amino-terminus of GAL4 (yeast transcription factor). The binding reaction of this tag to the anti-DYKDDDDK antibody is calcium dependent, so proteins can frequently be eluted from an affinity matrix by buffers containing EDTA. It also allows for the tag to be placed at the amino-terminus, at the carboxy-terminus, or in association with other tags. Order DYKDDDDK peptide ($50 per mg) from here. LifeTein's anti-DYKDDDDK monoclonal antibody was developed based on the most widely used hydrophilic octapeptide: DYKDDDDK. Order DYKDDDDK peptide ($50 per mg) from here. LifeTein's anti-DYKDDDDK renders higher affinity and higher binding capacity than Sigma's antibody. Please see the following table for technical details. DYKDDDDK (FLAG*) synthetic peptide conjugated to KLH. Order DYKDDDDK peptide ($50 per mg) from here. Anti-FLAG monoclonal antibody was purchased from LifeTein to study the cyclooxygenase-2 (COX-2). It was found that the COX-2 can fold into a preexistent confromational heterodimer. COX-2 half-sites functionality results from COX-2 folding into stable conformational heterodimer. 2. JM Eaton, GR Mullins, DN Brindley, TE Harris, Journal of Biological Chemistry, 2013, Phosphorylation of lipin 1 and charge on the phosphatidic acid head group control its phosphatidic acid phosphatase activity and membrane association, doi:10.1074/jbc.M112.441493jbc.M112.441493. 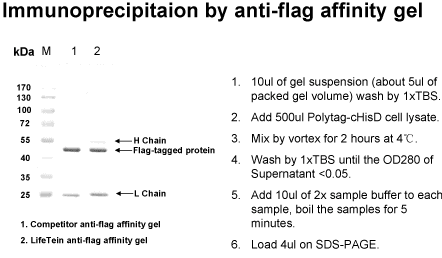 The FLAG sequence DYKDDDDK is frequently used for affinity purification. Synthetic FLAG peptide by LifeTein was used in the elution buffer to purify lipin 1 protein. It was found that the Lipin 1 preferentially binds di-anionic phosphatidic acid and this is eliminated by phosphorylation. 3. Brain tumor senescence might be mediated by downregulation of S-phase kinase-associated protein 2 via butylidenephthalide leading to decreased cell viability, 2014，1010-4283，J Tumor Biology. Anti-FLAG monoclonal antibody was purchased from LifeTein to study the Brain tumor senescence. It was found that BP-triggered senescence in GBM cells is highly associated with its control on Skp2 regulation. 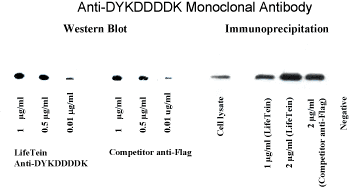 Anti-FLAG monoclonal antibody FG4R was purchased from LifeTein to study the protein-protein interactions by Western Blot. 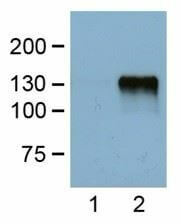 Anti-FLAG monoclonal antibody was purchased from LifeTein to perform Co-IP Assays.